Many of us want to earn extra money from home. And, indeed, starting a home business can be a good way to cultivate additional income, and help you reach other financial goals that you might have. 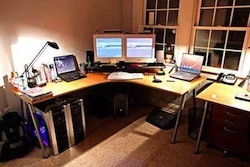 There are a number of ways that you can improve your situation by starting a home business. From creative business ideas, to the more mundane, here are 50 home business ideas. Online Store-If you are serious about starting a home business then an online store is an excellent place to start. The best part of an online store is that you do not need a large start up capital, with just a few hundred dollars you can start your own online store. Besides the low start up cost an online store has many other benefits, for example it does not require you to rent office space, it has low overhead costs, does not require long hours etc. If you know what you want to sell online great, however you don’t need to know right now. I know it may seem overwhelming and confusing at first, however I would highly recommend Steve’s course on Profitable Online Store. Steve and his wife started their ecommerce store a few years ago and in their first year they made over $100,000! His wife was able to leave her day job and now only works 4 hours a week. Steve has extensive experience in the commerce business and has helped hundreds of students in successfully launching their business. He doesn’t just send you the material and leave you stranded, but he is there with you every step of the way with regular office hours (virtual office). If you are tired of your 9-5 job and want to break free then an online store maybe the answer. Check out Steve’s course and I would highly recommend you enrol in it, it will probably be the best investment you ever make. Writing: I always list this first because it’s what I do. If you write, and have reasonably good grammar, you can find gigs providing content, working for print and online magazines, preparing whitepapers (and doing other technical writing), and providing ad copy and press releases. All form the comfort of your home. Graphic design: Create logos, newsletter layouts, images for ads and other visuals for a variety of clients. Web design and development: Set web sites, and even maintain them. Develop different aspects of web sites, and design web sites for usability. App development: Those who know how to develop apps for different mobile devices, and even those who develop web apps, can make money with their skills. Create apps for others to use, or even for them to sell, and you can get your cut and make a profit. Social media/SEO services: If you are good online, and build social networks, you can leverage your skills to make money by providing your services to others. Help companies and web site owners build their brands in the social media space. Photography: Use your skills to take photos at different events, and even take portraits. Take stock photos and sell their use on stock photo web sites to create a tidy passive income stream. Videography: You can also make videos of special events, and put together montages for special events like birthday celebrations. Presentations: If you have skill at putting together presentations, you can create presentations for others. Make music: Those with musical skill can make money by hiring themselves out for events, as well as by playing in different venues. Many restaurants like to have live music at least some nights a week, and you could make money from the tips people provide for your playing. Consulting: Any skill and experience that you have in a number of areas can be used to help you start a consulting business. From knowledge of statistics, to communication, to image, to public relations, it is possible for you to put your knowledge and skill at others’ disposal and make money. Tutoring: Start a tutoring business out of your home. You can approach by providing tutoring help in an area you specialize in, such as math, or English, or test-taking. You can also start a business that allows you to work with others, paying tutors and helping clients get the academic help they need. Music lessons: For a brief period, I taught piano lessons. (I discovered that teaching was not my forte.) If you know music, whether it’s playing a musical instrument or using your voice, you can share that knowledge, and earn some money. Art lessons: Teach children and others art. If you have a knowledge of painting or drawing, you can teach others. Online teaching: One of the growing areas of interest is in online teaching. If you have a college degree, you can teach college level courses in some cases. There are also virtual K-12 schools. You can, if you are ambitious enough, and get the right licenses, open your own virtual academy. Gardening: Many people need help learning to garden. You can offer your services in helping people set up gardens, and learn to grow their own food. Container gardening classes can help clients learn to grow food in small spaced. Preserving food: If you know how to can, bottle or dry foods, that’s something that others might pay to learn. You can teach classes and even sell small recipe booklets with ideas for what can be made using preserved ingredients. Guide: Do you know your local area? The best places to go for fishing or hunting? Do you know a stretch of river? You can start a business guiding people in the area. Even if it’s just a restaurant tour of the tastiest places in town, your guide efforts can be profitable. Technology: Start a business teaching others how to use technology. There are a number of people who need help setting up their computers, phones and gaming consoles. You can use your knowledge to your advantage. Craft classes: Hold craft classes in your home. If you know how to sew, crochet, knit, work wood, sculpt, or frame photos, you can teach these classes, earning some money and doing something you love. You left out power generation. We have been generating solar power for a week and a half (although there has not been much sun in that time, here in eastern Ontario). There is also wind power. Great list of ways to generate income. Thanks for sharing! These are great ideas but are they still viable when so many people have limited funds right now? Most of the ideas listed here don’t cost much, if anything, except some time and patience. Starting capital is not a problem for people with the great ideas. If you can’t find a way to finance your idea it is not great, clearly articulated in term of how you are going to implement it, no sufficient proof that it is viable, you do not have what it takes to implement it or do not know how to assemble and manage a team of able people to assist you . Miranda – great list. I’ve been running my freelance copywriting business from my home for several years and it’s great. Plus, to confirm what you wrote, it’s requires a fairly modest investment to get started – and the demand is huge. Glad to have found this site – looks like some great info! Hi, Kindly guide me thru the online writing stuff. I am interested in advertising writing (copy) and publications. Will be glad to get tips on how to start. What about if you are renting the house where you live .Can you still run a business form home? Depending on what kind of business you can. If it is an online business it shouldn’t be an issue, if it is something that might damage the house or require modification you should speak with your landlord. This is a fantastic list. I prefer an online business to a home business where I need to use space for products and shipping. You can achieve anything you want with your business if your passionate about it with a good plan of action. Great list! Really great article with lots of great ideas. I actually tried the freelance writing thing with hopes that I would one day be able to quite my 9-5 job. I did make money but not enough to quite my job. Eventually I ended up finding my success by being an online merchant with my own e-commerce site. Was able to quite that 9-5 job years ago and now have the privileged of having a 9-9 business instead! ha ha! Work longer hours now but I am always at home with the family and financially reap the rewards. I still do the freelance writing sometimes just for the love of writing and the few extra dollars never hurts. Again, great article with lots of ideas! Hi, I am so interested in working from home and being my own boss. It looks as though you have figured it out. What are you selling, how did you start and how are you making it work? How can I start/setup a home business with passive income investing? Awesome list of home business ideas……probably the best one I have found so far. Thanks for sharing! I am interested in a couple home business ideas, if anyone has first hand knowledge or any suggestions it would be greatly appreciated. I want to do like a Meals Delivery Service. For the Elderly who do not qualify for “Meals on Wheels” due to income to high, single people with no time, single parents with NO time, families that both parents work or just people who HATE to cook. And I would have a delivery time & 3-5 meal choices each week. Second one is an online business where I give meal suggestions for people tired of same ole thing or children don’t like certain foods. I have owned a Deli & Catering company before as well as come from a large Italian family & have lots of cooking experience & its my love of life. Any ideas, suggestions VERY much appreciated. Thank you. H0w do I start to sell what I make? Try esty, it is a great site to sell hand made items. People will be looking for what you do. I do not think home business works for people with less money to start business at home. I tried to advertise for people with kitchen bussiness selling knives and utensils online but it was a waste of time. I started lending money to friends with interests when they pay me back, but some are idiots to me back. What is the right way to have money and make money? I think it depends on what you want to do. You can do a lot of freelance stuff such as writing, virtual assistance, social media etc. Blogging can also be a great way to make money if you put in the time. Great post. I am planning to grow my own company about training and coaching but I need a little more information about the know-how, marketing and how to structure an event. Thanks in advance for any further information. This is really great information and in these times of economy trends we need all the help we can get. Thanks again for great info.